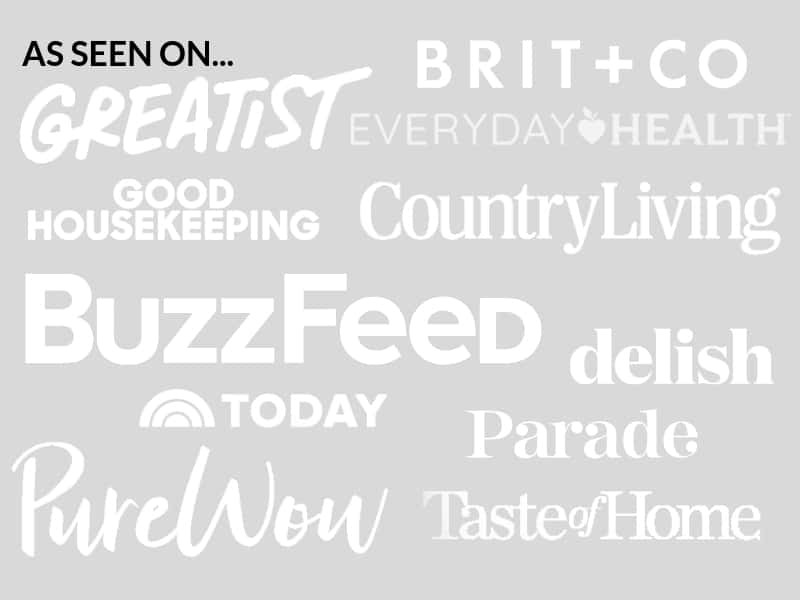 August 8, 2018 By Elizabeth Lindemann Leave a Comment / This post may contain affiliate links. I love classic wedge salads, but I really don’t like the fact that you have to eat them with a knife. This Deconstructed Wedge Salad has all the same refreshing, classic taste but no knife necessary! 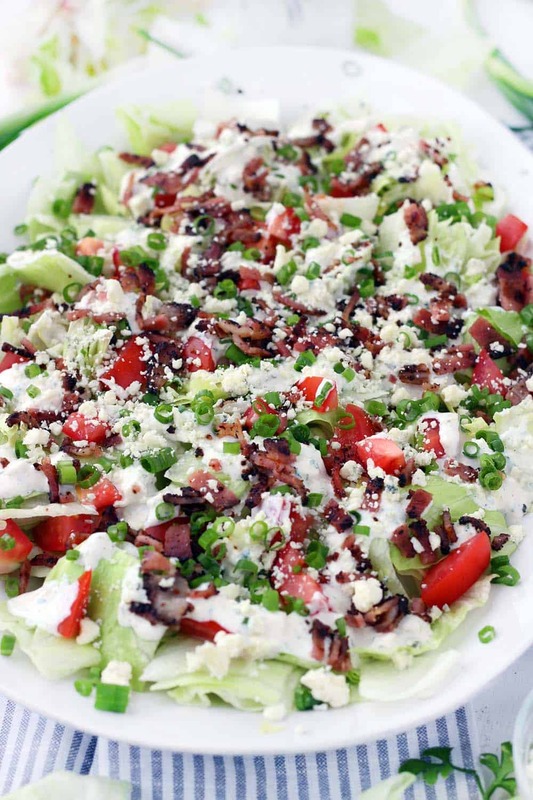 Iceberg lettuce is roughly chopped then topped with crunchy bacon, scallions, fresh tomatoes, and homemade blue cheese dressing (plus extra crumbles, because blue cheese is awesome). As much as I know dark leafy greens are better for me, I just LOVE iceberg lettuce. It’s cool and crisp and refreshing- I love the audible “crunch” you get when you bite into it. Iceberg lettuce works perfectly with the thick, chunky homemade blue cheese dressing, since it’s sturdy and can hold up to such a hearty dressing. And it goes SO WELL with bacon. A BLT is just not the same without a thick piece of crunchy iceberg lettuce added to it! A traditional wedge salad is served, as you would expect, in wedge form. 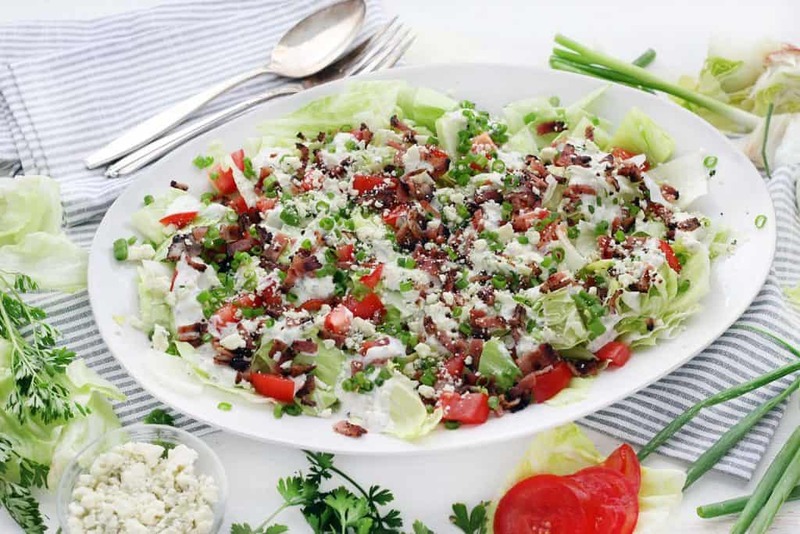 The iceberg lettuce is cut into wedges, then served pointy-side up and covered in blue cheese dressing, bacon, tomatoes, more blue cheese, and chives. This is almost exactly the same, except I used scallions instead of chives (because I had them in my fridge- feel free to use chives if you want!) and I roughly chopped the iceberg lettuce instead of serving it in wedge form. I love ordering wedge salads when I’m out to eat and get excited seeing them on the menu. Anything with bacon and blue cheese always seems to call to me (like this Sweet Potato Soup with Bacon and Blue Cheese… YUM). But they are always a bit unwieldy to eat. You have to get in there with a knife and a fork, and the rounded edge of the lettuce wedge always seems to slide around. As someone who is fairly accident-prone and clumsy, I’m always nervous about spilling on myself or inadvertently flinging the wedge onto the floor. Or onto a neighbor’s plate. I opted to make the blue cheese dressing myself, since I had most of the ingredients on hand. If you want a shortcut, feel free to use store bought (I love Marie’s– it’s my go to for blue cheese and ranch!). The dressing is super easy to make. Just mix some blue cheese crumbles, buttermilk, sour cream, garlic powder, salt, pepper, and fresh chopped parsley in a bowl. It’s best if you make this at least a couple of hours in advance and keep it in your fridge to let the flavors marry together. And if you want, you can make it up to a week in advance! This recipe is for a chunky blue cheese dressing. 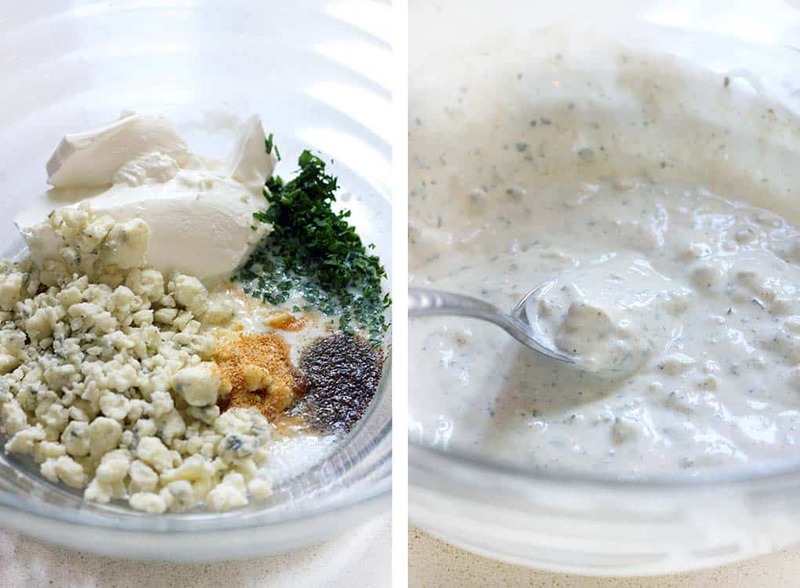 It’s super easy to make a smooth blue cheese dressing- just microwave the crumbles for 10-15 seconds until they begin to melt, then add all the ingredients to your food processor or blender and turn on until everything is smooth and blended together. It’s an Ina Garten trick in her version of a wedge salad (which ALSO uses scallions and doesn’t conform to the traditional wedge- we must be kindred spirits). Usually, salads aren’t great if you assemble them in advance. But the iceberg lettuce is so hearty and the dressing is so thick that you can make this up to two hours in advance- dressing and all- and keep it stored in your fridge until you are ready to serve (because you want it to be ice cold!). Any longer than two hours and you risk the lettuce and tomatoes getting soggy. I served this with blackened tilapia as a delicious low carb dinner. The spiciness of the blackening spice was so great with the cool lettuce and creamy blue cheese dressing! It would also be great with some grilled chicken, buffalo chicken, or oven bbq chicken. If you like this deconstructed wedge salad recipe, you’ll like this lightened-up cobb salad with buttermilk ranch dressing and this cold potato salad with buttermilk dill dressing. Both great ways to use up any extra buttermilk you have from making the blue cheese dressing! 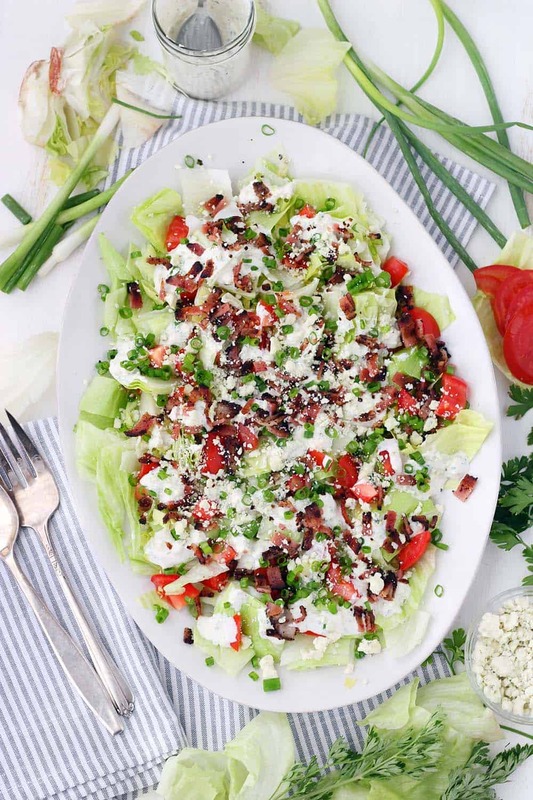 This Deconstructed Wedge Salad recipe has all the classic, refreshing flavor without the need for a knife! 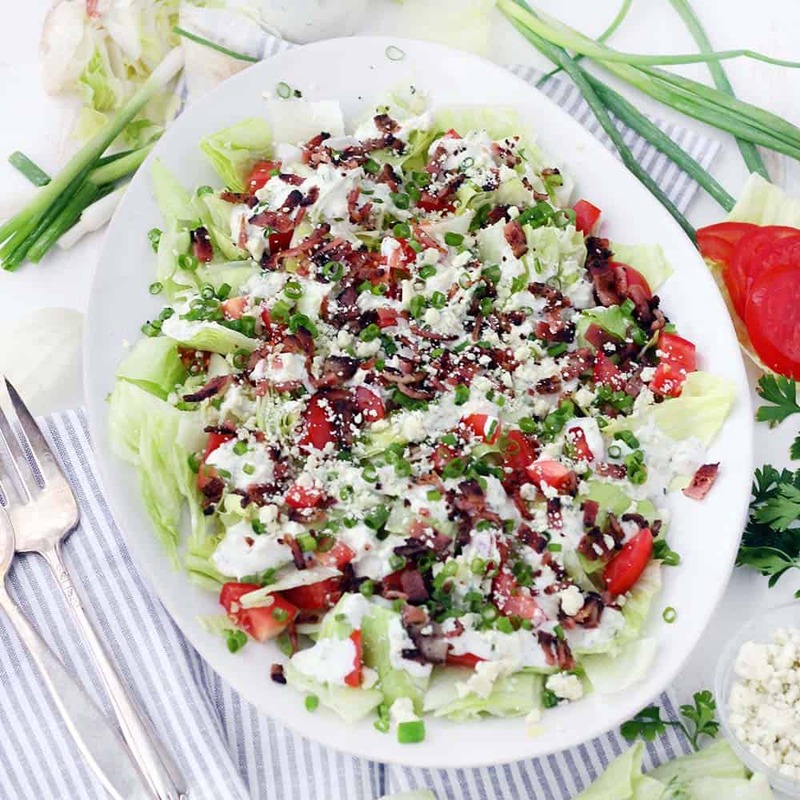 Chopped iceberg lettuce is drizzled with homemade blue cheese dressing and topped with crunchy bacon, green onions, and fresh tomatoes. Mix all of the ingredients for the dressing together in a medium bowl and set aside (it's best to do this at least a couple of hours in advance and refrigerate to let the flavors marry together). Arrange the iceberg lettuce on a large platter. Top the lettuce with the blue cheese dressing. The dressing is thick, so try your best to evenly distribute it across the surface. Top with tomatoes, bacon, green onion, and blue cheese crumbles. 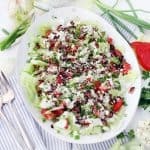 This salad can be assembled 2 hours in advance and kept in the refrigerator until you are ready to serve- no longer than that, as the lettuce may get soggy. You can make the blue cheese dressing up to a week in advance. For a creamier blue cheese dressing, microwave the blue cheese crumbles for 10-15 seconds, then use a food processor or blender to mix all of the ingredients together, as this will break the crumbles down. I recommend serving with oven BBQ chicken or blackened tilapia to make this a full meal.